Project managed by Noel on behalf of ABS West. WALLS WITH UNUSUAL ANGLES - NOT A PROBLEM! ABS West can custom manufacture handrails to provide seamless support, regardless of the wall angles. WALLS WITH SERIOUS CURVES - NOT A PROBLEM! The boys at ABS West are proud of their ability to make handrails wrap perfectly around curving walls. The combination of warm timber and sleek stainless steel, makes this handrail prefect for both traditional and contemporary interiors. In aged care facilities, reliable support needs to be provided in all areas, including across window recesses as pictured here. The sleek, easy clean surface, makes our handrails perfect for areas where hygiene is important, such as dining rooms and food preparation areas. If you have a requirement for handrails in a healthcare, aged care, retail or commercial setting, give us a call or explore more information on our handrail product page. Not everyone can master such sleek curves when it comes to handrails, but the boys at ABS West pull it off in style! Browse our handrail product information and find out about available styles, finishes and dimensions. Take a look at the image gallery featuring other handrail projects. 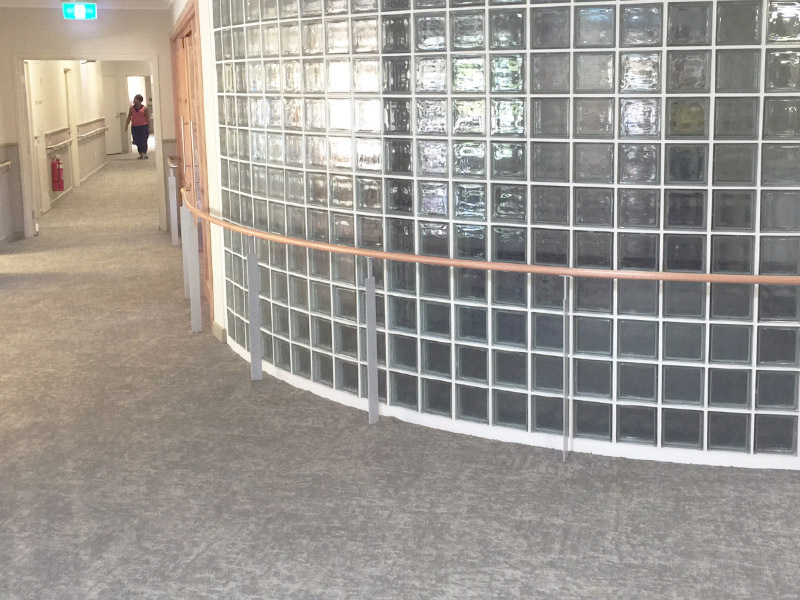 Find out why CS handrails are so often used in health and aged care applications. * Please note that the indicative installation time stated on this page relates to this project only and should not form the basis of any assumptions regarding future projects. Project variables determine individual installation times, with estimates provided before project commencement. Furthermore, the stated time relates to onsite installation and does not include product manufacture time, site measurement or any other processes carried out prior to actual installation.